Gamal Mubarak may not be entirely interested in following his father Husni as Egypt's president. His background is in finance and economics, and some analysts suggest that politics leave him cold. As the Obama administration crosses its fingers in the hope that an Iraq currently without a government will somehow stabilize and justify the American blood and money spent over the last seven years, Washington has started to turn its attention to what has historically been one of Baghdad's rival centers of Arab power—Cairo. Things are changing in Egypt as well, for barring any last-minute surprises, the ailing 82-year-old president, Husni Mubarak, is reportedly on the verge of enjoying the highest privilege afforded Arab rulers—to die in bed of natural causes. 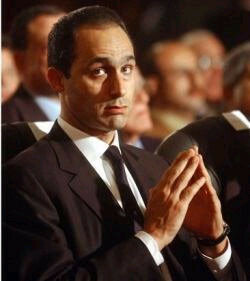 It seems almost certain that he will be succeeded by his second son, Gamal, the 46-year-old, one-time London financier. The speculation inside the Beltway is that either Gamal will replace his father on the ruling National Democratic Party's (NDP) ticket for next September's presidential elections, or that Husni Mubarak will not last that long and the constitutional process will kick in, paving the way for Gamal's nomination and election. Another Mubarak would spell continuity of a sort even if it meant an end to nearly six decades of military rule by the "Free Officers" regime. While it is true that Gamal has relationships with the military establishment not only through his father but also by way of intersecting business interests—some Egyptian industries are essentially military-run concessions—the fact remains that he is not a military man. "To be part of the military establishment is not just about your connections or family," says Muhammad Elmenshawy, Washington bureau chief for the independently owned Egyptian daily newspaper Al-Shorouk. "It means that you've worn a uniform, or you've fought in a war. Gamal is a complete outsider." This perhaps raises a historical analogy: The Mamluk sultans (1260-1517) tried to get their non-slave sons to succeed them and sometimes managed it, but they were not from the military slave caste and eventually petered out, to be replaced by a proper Mamluk. The bulk of Gamal's task, at least early on, may be to ensure that history does not repeat itself. Most Washington officials are comfortable with Gamal and see no fundamental change in the U.S.-Egyptian relationship on the horizon or adverse effects on the Egyptian-Israeli peace accord that is the foundation of the U.S. position in the eastern Mediterranean. Indeed, the fact that Gamal accompanied his father to the pre-Labor Day peace summit in Washington that also included Israeli prime minister Benjamin Netanyahu and Palestinian Authority president Mahmoud Abbas along with Jordan's King Abdullah II, was read as a signal that the succession issue had been resolved. Until now, Mubarak has not only declined to appoint a successor, or even name a vice president who would assume the presidency in the event of an emergency, but has also avoided discussing the political prospects of his second son. According to officials from the Bush administration, whenever the president asked after Gamal, the Egyptian ruler would quickly change the subject. It is widely believed that the Egyptian president is less eager to have his son inherit the post than is his mother, the first lady Suzanne Mubarak. Does Gamal Even Want the Job? Other U.S. policymakers are not sure that Gamal himself is entirely interested in the job. His background is in finance and economics, subjects that seem to elicit his passion. And indeed, thanks largely to Gamal and his cadre of technocrats in the NDP, the Egyptian economy has enjoyed a period of growth for half a decade or more. Even as little of the wealth has trickled down to improve the lot of the poor—20 percent of Egyptians live in abject poverty, and 60 percent live on $2 a day—the thriving economy has changed middle-class perceptions. Egyptian parents, Elmenshawy explains, are less impressed these days when their daughters are courted by members of the military and security establishment and more apt to be swayed by young men who have made careers in banking, telecommunications, or the big real estate deals taking place in New Cairo. If Gamal cares about the economy, this seems to come at the expense of his interest in politics, a topic that leaves him cold or, in the words of someone who has been in the room with him, brain dead. This is a dangerous liability for a man required to keep in check competing centers of domestic power—including the Muslim Brotherhood, the Egyptian military, and the intelligence services (mukhabarat)—and regional actors while also accommodating his U.S. benefactors without aggravating an Egyptian population that has always been, at best, wary of U.S. influence in the Middle East. On the other hand, it is possible he has just learned well from his father, the stone-faced former Air Force commander who has steered the Free Officers' regime on a steady course for almost thirty years between the radicalism that devastated Nasser's Egypt and the then-startling accommodations with the United States and Israel that got Sadat killed. And so the question in Washington is, what will this transitional Egypt look like? "The physical decline of Husni Mubarak coincides with the decline of Egypt as a regional actor," says David Schenker of the Washington Institute for Near East Policy. Never mind the fact that Iran sets the region's political tempo while Qatar and Dubai's satellite TV networks have eclipsed Cairo's as the region's media capital. "Egypt can't even get a veto on upstream Nile development projects anymore from upstream African riparian states, like Ethiopia." Michele Dunne of the Carnegie Endowment for International Peace agrees that the Cairo regime is not what it once was. "Domestic affairs take up so much time that Egypt is far less able to play an effective role in regional affairs. Even the succession issue itself preoccupies them and absorbs energy. Egyptian influence is much less than it was even twenty years ago though part of that is because other Arab states have caught up in terms of education and communication and moved past Egypt in terms of development. But Egypt just can't present a compelling model, a compelling argument, or philosophy that other Arabs want to imitate." The Egyptian opposition, says Dunne, is another matter. "Look at Kifaya, which started in 2004, and then the way Facebook took off and rallied people. These things inspired imitators around the region. Egypt is still an important country that other Arabs look up to, but its energies ensue not from the government but from those that are opposed to government." To be sure, one of the biggest stories surrounding the succession issue is Mohamed ElBaradei's decision to challenge the regime with his unofficial campaign. Even as the Nobel Peace Prize winner and former International Atomic Energy Agency (IAEA) chief is not—not yet anyway—a member of a political party and thus not eligible to run in next fall's elections, his presence has generated attention both inside and outside Egypt. "There's a weird infatuation with Baradei," says Steven Cook at the Council on Foreign Relations, referring to fawning notices in U.S. press outlets including The Washington Post and The New Yorker. "But in a fairly bleak political environment lacking charisma, Baradei shakes things up. He says, 'I am not going to run unless I can be assured of free and fair elections,' and this really throws a monkey wrench into the system and shakes up Gamal's claims to legitimacy." "I like the idea of Baradei," says Schenker. "I like the idea of an ostensible liberal. Baradei came along and said things openly, and no one could touch him. He seems to be in the vanguard of a political culture that is less fearful of the government." Nonetheless, explains the former Bush administration Pentagon official, ElBaradei wouldn't be particularly palatable in Washington. "He politicized the IAEA, oversaw the nuclearization of Iran, and maintains that Israel is the most dangerous state in the Middle East," says Schenker. Given that ElBaradei was comfortable working with the Islamists who govern Iran, it is hardly surprising that he has joined forces with Egypt's own Islamists, the Muslim Brotherhood, in order to focus on political reform. Presumably the Brotherhood is happy to let ElBaradei take the lead since his previous employment and profile afford him international political protection not extended to the Islamists. The Brotherhood, says Joshua Stacher, an assistant professor at Kent State, is not going to make a big deal out of the succession. "I have talked about it with them exhaustively, including senior leadership," says Stacher, who has done extensive research on the movement. "All oppose an inherited succession in principle, but they will not mobilize in an organized way, and there will be no overt signs of discontent. Presidential succession is extremely important to the elites in Egypt, and the Muslim Brotherhood doesn't want to challenge them on something they hold this close to their hearts. They all think it's unjust but, as one told me, 'at the moment of the transfer of power, the Brothers will be silent.'" In exchange, says Stacher, the Brotherhood is not exactly expecting a quid pro quo. "The MB is not going to be handed the keys to the parliament, but they're not going to be shut out completely either," he explains. "Gamal or whoever becomes president will have to renegotiate with a large array of interests and social forces, which includes the Muslim Brotherhood." Indeed, Washington policymakers and analysts concur that the real campaigning will take place after Gamal becomes president rather than before. "Arab leaders are always most vulnerable just when they take office," says Stacher. "They are busy consolidating power and eliminating enemies." The two most obvious, and recent, examples are Syrian president Bashar al-Assad and Jordan's King Abdullah II, both of whom also followed their fathers. According to press accounts and contemporary scholarship, both Abdullah and Bashar spent a considerable amount of energy during their early years at the helm building their power bases and eliminating the so-called "old guard" remnants from their fathers' diwans. However, the fact is that both Bashar's and Abdullah's paths to power passed directly through regime strongholds. Abdullah was the commander of the Hashemite Kingdom's special forces, an elite unit that ensures the regime's survival; and Bashar was handed the extremely sensitive Lebanon portfolio, which during the years of the Syrian occupation was essentially Damascus' ATM, feathering the nests of the country's numerous security chiefs. Unlike those two soon-to-be peers, Gamal has no such foundations in regime management, which is why so many believe that Omar Suleiman, chief of Egypt's General Intelligence, is the man to watch. While it had been rumored that Suleiman was another presidential possibility, and still may be, he is ineligible, right now anyway, since he is without membership in a political party. At any rate, the key issue is where Suleiman stands on Gamal, and whether or not he will stick his neck out for a novice with no military or security credentials tasked to run what is still a military regime. Certainly the $1.3 billion in U.S. military assistance to Egypt is evidence that Washington, however happy with the country's recent economic performance, still sees Cairo as such. Perhaps a more useful question is, how does Cairo see itself? In a sense, Mubarak was only continuing Sadat's work of extricating Egypt from troublesome regional issues, especially the Arab-Israeli conflict, as it went from frontline combatant to peacemaker and mediator. Gamal is likely to wish for more of the same inward turn and to focus on the economy, but the Middle East has its own energies and forces to which an untested leader, one at the helm of the largest Arab state, may be especially vulnerable. The main issue right now is Iran, which has effectively patterned itself after Nasser's Egypt in its struggle to build a regional hegemony and challenge the U.S.-backed order, which presently includes Egypt and the other "moderate" Arab states along with Israel. The Egyptian masses might be infatuated with Iran, says Elmenshawy, "but the elites see it as anti-Western and isolated from the rest of the world. It is not an appealing model for them." Still, Cairo has decided to restart its own nuclear program but understands that the prospect of an Iranian bomb is only one aspect of Tehran's regional strategy. Even without a nuclear weapon, Iran is dangerous to Egypt through its allies and assets, from Syria to Hezbollah, and especially Hamas, sitting on Egypt's border. "If I were part of the Egyptian elite," says Stacher, "I'd be most worried about Gaza. If that spills over the border, it can derail everything." One way to defend against Hamas is to seek to co-opt them as the Turks have tried. And indeed one possibility considered throughout Washington is what might happen if Cairo follows Ankara's lead. If U.S. power is perceived to be on the decline, what if Egypt, like Turkey and Iran, questions some of the assumptions of the U.S. order? Egypt could force the issue with the Israeli nuclear program and could even question demilitarizing the Sinai. It is highly unlikely that the Egyptians would take it as far as making war on Israel, but they could make themselves more obstreperous, just as the Turks have done, such as when they dispatched the "humanitarian flotilla" to Gaza. Now that the Turks are bending to the new regional winds, it is hardly clear that Washington has exacted a price for their behavior or even warned them. That it is acceptable to cross Washington is not a message the United States wants to send its regional allies, especially Egypt, one of the foundations of its Middle East strategy. From Nasser through the pre-October 1973 Sadat, Washington was accustomed to Egypt being the primary regional power that questioned the U.S. order. Sadat's strategic shift made Egypt one of the pillars of the U.S. camp, which Washington has taken for granted just as it had done with regard to Turkey's strategic orientation. The passing of Mubarak and the rise of his successor, presumably his son, means that the largest Arab state's future orientation can no longer be taken for granted. Lee Smith is a Senior Editor at The Weekly Standard and the author of The Strong Horse: Power, Politics and the Clash of Arab Civilizations. Daniel Sobelman, "Gamal Mubarak, President of Egypt?" Middle East Quarterly, Spring 2001, pp. 31-40; "Gamal Mubarak: 'We Need Audacious Leaders,'" Middle East Quarterly, Winter 2009, pp. 67-73. Ha'artez (Tel Aviv), Aug. 31, 2010. Ilan Berman, "The Islamist Flirtation," Foreign Policy, Apr. 2, 2010. Related Topics: Egypt | Lee Smith | Fall 2010 MEQ receive the latest by email: subscribe to the free mef mailing list This text may be reposted or forwarded so long as it is presented as an integral whole with complete and accurate information provided about its author, date, place of publication, and original URL.